A (reading) Room of One’s Own. The film ‘Adaptation’ is about writing a screen adaptation of a book, so a screenplay within a screenplay. Charlie Kaufman (played by Nicolas Cage) places himself into the action. Virginia Woolf’s ‘A Room Of One’s Own’ reminded me of this, as the first couple of chapters are about her attempts to write the essay about ‘Woman and Fiction’, her research and her visit to Fernham, a fictional Oxbridge college. Here she is chased from the protected lawn by a beadle (calling to mind Dennis the Menace and a park keeper), and as a lady, is not allowed entry to the library as she is not escorted by a Fellow, nor does she has a letter of introduction. As I have previously stated, I am intimidated by Virginia Woolf (even when small and knitted), and the notion anyone would tell her to get off the grass or turn her away from a library chills my internal organs. All of them. It is also here she is fed bland gravy soup, beef with greens and potatoes, stringy prunes and custard and dry biscuits with cheese, after which comes the famous quote ‘One cannot think well, love well, sleep well, if one has not dined well.’ Ouch, for whoever cooked that meal. Ouch in print for all eternity. Virgina is then in London, at the reading room in the British Museum. She is hoping to fill her notebook with truths that will make writing the essay easy, but she takes random notes in declining handwriting, and draws pictures on the paper provided. The work grows, and the other famous quote arises ‘A woman must have money and a room of her own if she is to write fiction.’ And Virginia tells us how, after years of teaching nursery children, addressing envelopes, and getting newspaper writing jobs such as reporting from donkey shows, she was left £500 a year for life by an aunt. Much fun with an inflation calculator tells me that was around £28,000 at the time, an amount which rose a little in worth during some years, but fell overall as expected. But this freed Virginia from jobs she hated, and from security provided by a man, and gave her time and space to visit colleges and spend mornings in the British Museum and then wander about Bloomsbury looking for somewhere to have lunch. I believe if anyone wants to write fiction conditions will not stop them, but there’s something to be said for not having the mental exhaustion of long hours in a hated job and/or small demanding children. Although, I’ve found writing to be therapy for these things. 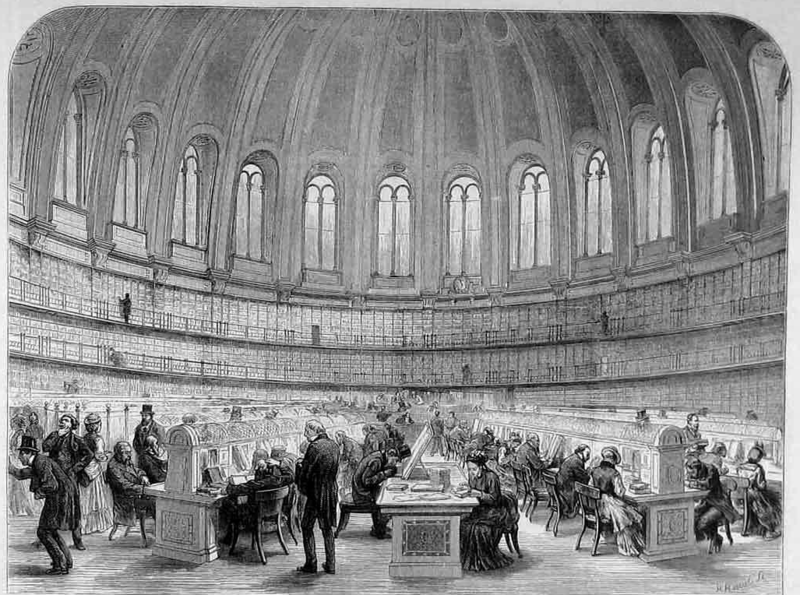 The reading room is currently used as general space for various exhibitions, the desks cleared out the books moved to the British Library. Boo. I want to sit and doodle like Virginia Woolf. The reading room opened in 1857, with a breakfast of champagne and ice cream. I presume spillages on any of the books would have resulted in a head on a spike at Tower Hill.